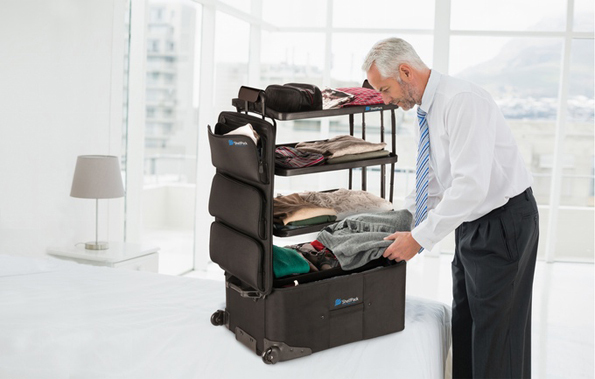 ShelfPack is a suitcase that’s equipped with retractable shelves. The genius luggage has got 4 built-in shelves that telescope out of the base, plus it’s got three outer compartments to keep like, I dunno, knick-knacks or doo-dads you got coming along. Just unzip, raise the supports, and lift the shelves. Now you’ve got a dresser coming out of your suitcase! I don’t know how I’m gonna stow away in there with all those shelves, but do you think that’s gonna stop me from trying? No. What’s gonna stop me is I’m claustrophobic and being zipped up in a suitcase for any amount of time is pretty much the most terrifying thing I can imagine. Outside of being buried alive, that is.